SEO is fundamental to the success of your website and done well, it can provide higher rankings and increased traffic. However, it’s also quite technical and it can be easy to make mistakes. 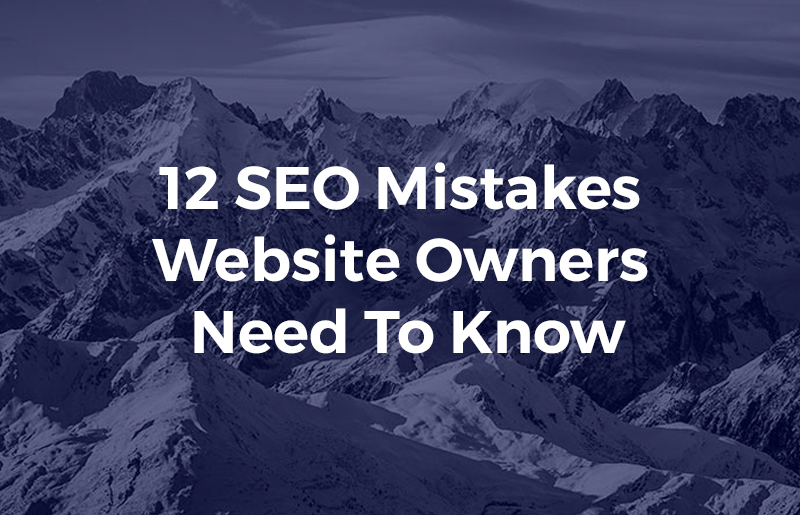 Here at Off-Piste, we see the same DIY SEO problems cropping up all the time and so, to help, we’ve put together a list of the 12 most common SEO mistakes that you should avoid. Here they are. Title tags are very important markers for search engines as they provide a clear indication of the subject matter of the page. This helps the search engine understand whether the content is relevant to someone’s search and, therefore, plays a key role in whether the page will get shown in the results or not. The main mistake people make with title tags is to cram them full of keywords in the hope that it will help the page rank higher. The problem with this is that the title is actually shown in the search engine results. If it is written just for the search engine and not for the searcher, then even if it does rank, it is unlikely to get clicked on. Which of these would you click on? Cheap Holidays. Cheap Vacations. Cheap Family Holidays. Budget Holidays. Thousands of cheap family holidays at great resorts. Save hundreds today. So, when writing title tags, do include your keyword but make sure you write for your audience, not the search engine. Most websites use headings to divide content into different sections, however, not all of them use heading tags. Instead, you often find that headings are created using bold or larger font. Without a heading tag, a search engine cannot tell that your headings actually are headings. This can stop them understanding the relevance of your subsections to the searcher’s query and prevent your page from ranking. Not only should you use heading tags, but you should also use the right tags in the proper place. You should use the <h1> tag for your main page heading, the <h2> tag for the main subheadings and, if your sections have subsections, you can use <h3> and even <h4> tags if required. Only use the <h1> tag once on each page as it acts in a similar way to the title tag, if you use it multiple times, the search engine can get confused about the subject matter of the page. You can put keywords in the headings, but they have to be relevant to the content of the section which follows and make sense to the reader. Whilst page length is by no means the only ranking factor used by Google’s algorithm, these findings indicate that the search engine is keen to provide its users with detailed information. This means that to rank higher, your content needs to be longer and more useful to the reader. Do note that padding out content with waffle won’t help. Poorly written content will cause readers to leave and the high bounce rates this produces are also taken into consideration by Google. So, not only does your content need to be longer, it also needs to be relevant. Thin slicing is the act of creating lots of similar pages, each using a variation of a keyword in the title, in order to rank for each of those variations, e.g. Babysitting Service London, London Babysitting Service, Babysitter Services London, etc. This form of SEO was popular before 2010 but is now obsolete. Search engine algorithms have come a long way since then and can now understand the relevance of a keyword to a search query even if the term used is not exact. This, however, leaves the thin slicing website in a precarious situation. With many similar pages, Google may be confused about which is the most relevant to rank – and may not rank any. Web pages can’t be shown in search results until the search engines have indexed them. To do this a search bot is sent to ‘crawl’ the site, moving from link to link, recording every page it visits and the path it takes to get there. It’s possible to block a page from being crawled in a number of ways. For example, you can accidentally change the settings of a page so that it instructs a search engine to ignore it. This is done using what is known as the robots.txt file. Alternatively, if a page is published but not linked to from a menu or other internal link, there is no way a search engine can find it. One of the reasons a page might not get indexed is because of poor site structure. Most well-organised sites use a pyramid structure where the homepage links to various sections or categories and each of these have their own subsections. This way, anyone who lands on the homepage is only two or three clicks away, at most, from the page they are looking for. If poor architecture stops users finding what they are looking for, it can impact negatively on your business and even prevent search engines from ranking the hard to find pages. In the UK, 66% of all web browsing is now done on mobile devices. Despite this, many websites are still not mobile-friendly and prevent users from viewing them properly. Google was so concerned by this that, in 2015, it made a change to its algorithm that stopped non-responsive websites from ranking highly on mobile searches. This change became known as ‘Mobilegeddon’. If you are still using a non-responsive website, you’re potentially missing out on 66% of your online business. However, Google has moved on since 2015. Now, instead of just wanting responsive websites, it is also keen for everyone to create AMPs (accelerated mobile pages): lightweight pages that load in an instant on any mobile device even if it is using a weak 3G signal. Soon, Google’s algorithm will change again so that AMP enabled sites will rank higher than those that are merely responsive. So, if you are not yet responsive, you’ve a lot of catching up to do. There is nothing wrong with having a site with a small number of pages, however, it can mean that you limit the number of keywords you can rank for. If you are a building company, for example, and carry out a range of different services, you should have a separate landing page for each of those services. One of the more technical aspects of SEO is the use of the ‘NoIndex’, ‘rel=canonical’ and ‘rel=prev/next’ tags. These important HTML tags are used to prevent search engines mistakenly thinking that content is duplicated. For example, on platforms such as WordPress, when you create a post it is put into two separate archives – a category archive and an author archive. If Google indexes both archives it might think that you have published the same post twice. By using these tags to ‘NoIndex’ the author archive, you can prevent this from happening. ‘NoIndex’, ‘rel=canonical’ and ‘rel=prev/next’ tags can work unpredictably if they are not implemented correctly. For example, if you use both ‘NoIndex’ and ‘rel=canonical’ on the same page, it’s likely that the ‘rel=canonical’ tag won’t function. Learning what these tags do and why you should use them can be quite complicated. It is always best, if in doubt, to seek the help of a professional SEO company, otherwise, it can have drastic effects on your SEO. · ‘Above the fold’ adverts that appear in the top half of the page. Backlinks are a very important ranking factor for websites because they inform Google that other websites think your content is useful to their readers. It is important, therefore, to promote your website on social media and through other means to generate interest that may lead people to link to you. There is, however, a very important caveat. The links to your site need to come from respectable sources. Whilst links from news sites, blogs, educational establishments and other businesses are great, links obtained in ways that infringe Google’s Webmaster Guidelines can result in a penalty or manual action. If that happens, your site will stop appearing in any Google search results. SEO can have a huge impact on your website, helping it rank highly for the keywords you need and increasing the number of visitors you get. However, optimising your site can be technically challenging and, as Google is always updating its algorithm, you can never be sure that what worked yesterday will have the same effect today. Indeed, some techniques which were acceptable only a few years ago are now likely to get you penalised. Hopefully, the 12 mistakes we have shown you in this post will point you in the right direction. However, if you have concerns about the SEO of your site and need a professional opinion of how it can be improved, drop us a line at hello@weareoffpiste.com – we’ll be happy to help.